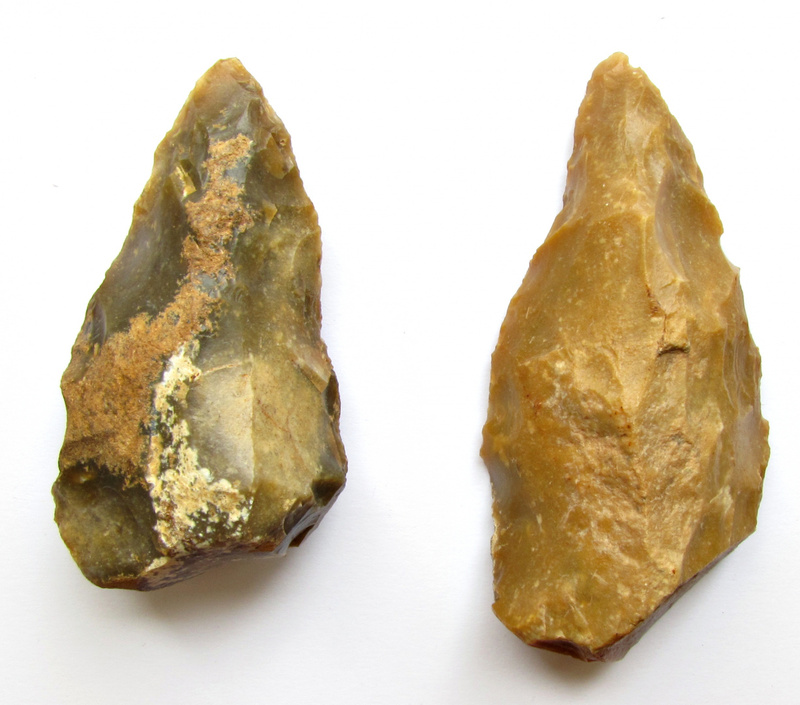 These are two trifacial core tools (biface triédrique, triface, pic sur dièdre cortical) from the Bergerac vincinity, the larger one is 14 cm long. They have both a symmetric triangular cross-section (Figure 1) and the planar dorsal side has been carefully shaped and reshaped by flat retouches, although much of the original cortex remained (Figure 2). The pieces (contra V. Mourre - see attached files) are certainly no preforms, but elaborated tools. It may be considered, that the pieces were preformed geofacts, which are common in the area, and were shaped by little effort, which has been demonstrated for the Bergeracois ensembles, but also for similar core tools (Bocksteinmesser) of the Central European Keilmessergruppen (KMG), recently reported by Berrin Cep / Tübingen. Trifacial concepts (É Boëda) are pretty common during several ensembles of the the early Middle Paleolithic in S/W-France ("Meridional Acheulian") but are regularly only present within a limited triangle between the Dordogne and Isle in the Aquitaine. In addition many of the Bergeracois ensembles (Cantalouette, les Pendus and Barbas) are associated with Flake Cleavers. This was first observed and published by J and G Guichard in 1966 see here: 2017 . It has to be mentioned, that in the Bergeracois core tools are always rare in excavated sites but common in surface Ensembles and that the early MP (MIS 9-6) in S/W–France is extremely diversified, especially regarding its debitage (opportunistic, discoid, rarely early Levallois, Kombewa, trifacial...). Many sites in the Bergeracois with trifacial tools are still non dated or from the surface, like the tools shown here. The abundant high quality flint of the region certainly prompted the specific character of these artifacts, but it remains strange, that other regions with similar opportunities in lithic production during the early MP (Middle Loire region; Northern France), remained virtually free of the systematic use of a trifacial concept. An exception is shown here: 1087 . In Northern France such artifacts reappeared not before late MIS6/early MIS5-see 1532 . 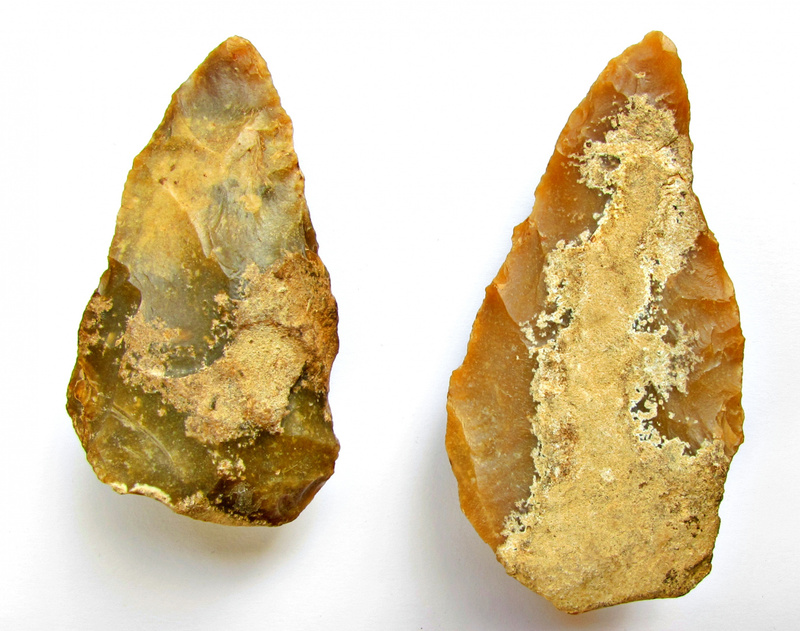 Compared to Europa, African Trifacial Handaxes are commen, especially during the Early and Middle Phases of the Acheulian-see 1602 . In Central and East Europe a tricacial concept becomes important within the KMG- interaction sphere.